Every year we ask the question, “Have you been #Naughty or #Nice?”. Join us this year for our annual #Gothic #Christmas #party! Every year we challenge our alternative community to get dressed up and celebrate the season. 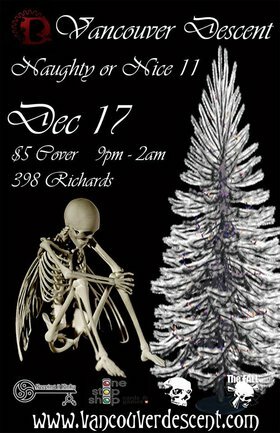 Join us for good company, fantastic #music, and plenty of #holiday merriment that won’t having you wanting to claw your face off. You can dance the night away to your favorite tracks and get the chance to win one of our fabulous prizes. In true Descent tradition, this year we will be giving away up to $500 worth of #gifts! Of course, to go with the theme, some of our #giveaways will be smaller gag gifts all the way up to beautiful pieces. #Prizes run from $1 to $100 each. All of our giveaways are wrapped and assigned numbers. Numbers are placed inside envelopes and distributed at random to the best #costumes, the best dancers, and those truly getting into the spirit of the event! What will you get? Completely the luck of the draw. But the only way to get your chance to win is to embrace the spirit and dress to impress! Everyone has their own #traditions and many of those are important around the #holidays. Naughty or Nice is a Descent tradition dating back to our opening year, 2007. We plan all year for it! Don’t make excuses, don’t stay home, and don’t miss this epic event! Say to HELL with Mondays, get dressed up in your best, and Make the Descent!